Afternoon Loverlies! 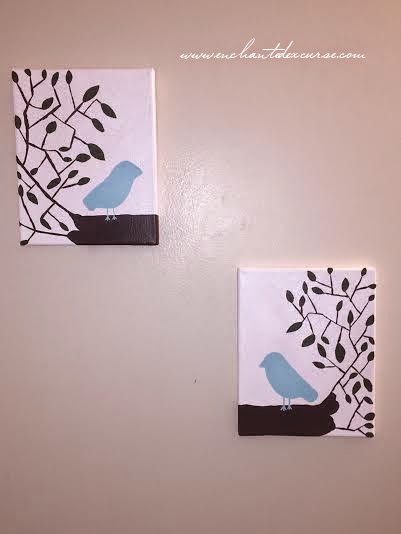 I decided to get some 8x10 canvases so I could make some little paintings as my bathroom Decor. I have a thing lately where I love decorating with Birds, and a mint blue color. My curtains have a big tree and some cute blue birds on it. I purchased the curtain a good while ago from Walmart. I used to like red in every room, but i'm slowly venturing away from it being in every room. 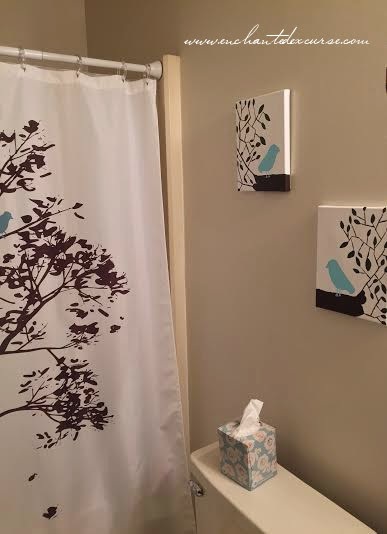 My shower curtain was inspiration for the paintings, because I just wanted to draw some birds on a tree limb to match the curtains. I think I am happy with how they came out. :) Enough blabbering and on with the pictures! Have A Blessed Day! I hope they look good how I hung them up. Thinking about getting a frame for them. Those are so cute! You've got great talent. Keep drawing/paining!